1 Cup of orange juice, 1 Cup of plain or vanilla yogurt (optional), 1/2 Cup of pecans, 6 pitted dates, 1 banana (preferably a frozen banana), 1 heaping scoop of NaturadeÂ® Total SoyÂ® vanilla flavor, 1 Cup of ice (after all other ingredients have been blended well). Combine all ingredients in a blender and combine in the order listed. Add ice only after all other ingredients have been blended. Blend well for approximately one minute. 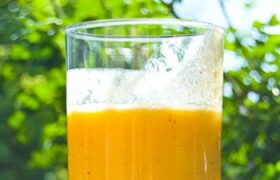 Pour Orange Cream Dream Smoothie in a tall glass. Serves 2. ENJOY!.